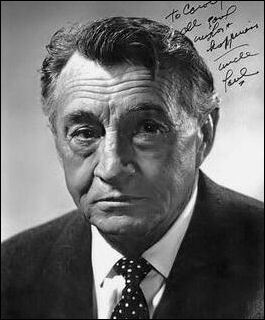 Paul Fix, character actor and writer of stage, screen and TV, was born March 9th, 1901 in the lower east Hudson River town of Dobbs Ferry, New York. Born in the German Black Forest, his parents, Wilhelm Fix and Louise C. Walz, emigrated to New York City in the 1870's. Paul's given name was Peter Paul, which he later informally changed to Paul Peter. He had 2 sisters and 3 brothers, the youngest was 6 when he was born, thus influencing his early childhood. They lived on the Manilla Anchor Brewery property of about 200 acres, as his father was the brew master. Paul had a happy childhood, playing a lot by himself and using vivid imagination. But when he was 13 or 14, his mother died at age 54 and two years later, his father died at age 62, thus forcing the brewery to close. He was sent to live with his married sisters, one in Yonkers, New York and the other in Zanesville, Ohio. 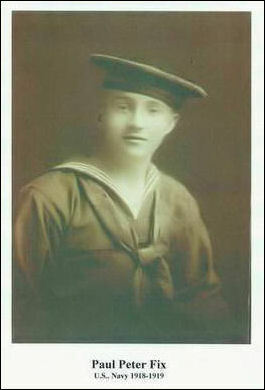 He wanted to fight for his country in World War I, so he joined the Navy on March 12, 1918,and served in Newport, Rhode Island ~ Charleston, South Carolina and on the troopship U.S.S. Mount Vernon, which was torpedoed off France but was run aground, thus preventing it from sinking. Surprisingly, his first stage role came while in the Navy in Newport, when he was one of 6 young sailors selected to play female roles (cousins and aunts) in the Navy Relief Show HMS Pinafore which was a big hit and ran for several weeks in Providence, Rhode Island and Boston, Massachusetts. After he left the Navy on September 5, 1919, he looked up his girlfriend, Frances (Taddy) Harvey of Zanesville, Ohio and they were married in 1922. Since he had always wanted to live in a warm climate, he tossed a coin: to go to either the Bahamas or California; California won, so he and his new bride settled in Hollywood. He didn't know what he wanted to do for a living, but he found writing and acting in local plays to be fun. Also in the play scenes were Clark Gable and Stu Erwin and they all became friends early on. He and his buddies were discovered by Pauline Frederick, an early stage star, and they were hired to be in her touring troupe that went by train up and down the West Coast giving plays. Paul was in 20 plays with Clark Gable. One of his first film appearances, he recalled, was in about the mid 1920's when he did a week's filming for a William S. Hart silent Western. After some small parts in silent films (where his roles were not credited), his first recorded part was in the 1928 film The First Kiss with Gary Cooper and Fay Wray. Filmed in Easton, Maryland, this movie was part silent and part talking. His daughter, Marilyn, born in 1925, later married Harry Carey Jr., thus joining another acting family. They had 4 children. In his career, Paul was in at least 400 films, thus making him the champion, being in more films than anyone else. He met John Wayne in 1931 when they were in Three Girls Lost, Wayne's first film. He went on to make 26 pictures with John Wayne, whom he coached behind the scenes on the advice of Loretta Young. During the 1930's Paul played mostly villains, gangsters, etc. and usually got killed. But that changed in the 1940's with John Wayne's grateful help. He is credited with three screenplays: Tall in the Saddle (1944), Ring of Fear (1954) and The Notorious Mr. Monks (1958). His last film was in 1979 in Wanda Nevada. He also made 2 films for TV that year: The Rebels and Hanging by a Thread. Among his favorites roles were: The High and the Mighty (1954) as a stricken passenger on a stricken plane, in Giant (1956) as Liz's Taylor's father, in the first Bad Seed (1956) as the academic grandfather of the devilish girl, and in To Kill a Mockingbird (1962) as the courtroom judge. During his career he played all manner of roles: soldiers, convicts, Chinese, cowb oys and Indians, sailors, females, gypsies, pirates, engineers, musicians, romantics and later as judges, doctors and sheriffs. Hey, how many actors do you know who have played females, cowboys and Indians? His TV roles were mostly guest appearances in numerous TV series and made-for-TV films. In 1965/6 he played Dr. Mark Piper, the ship's doctor, in the 2nd pilot film for the Star Trek series and was not the one finally chosen for the series. The only TV series in which he has a permanent role was as the mild-mannered Sheriff Micah Torrance in The Rifleman series with Chuck Connors, which ran from 1958 to 1963. He said in 1981 that he was still getting fan mail from all over the world for his part in this series. He died October 14, 1983 of kidney failure, leaving his daughter and son-in-law, 3 grandchildren and several great-grandchildren. The foregoing material, derived from Paul's unpublished oral history of his early life, a 1981 Los Angeles Times interview and a partial listing of his films, was written by Carolyn E. Fix, his admiring niece, whose father was William Fix, Paul's oldest brother. 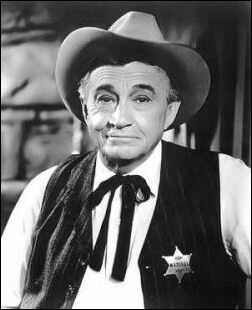 Some writers have erroneously given Paul's real name as Marion Morrison, which was actually John Wayne's given name. The Fix name, of old Latin/German origin, was derived from St. Vitus meaning animated or vital and is not related to the English word "fix" and its meanings. letter addressed to Mr. Paul Fix, Movie Star, Hollywood. Within two weeks he received a friendly note from Paul along with a photo of him as Micah Torrance. In 1988, Achim visited LA, but could not find anyone at Paul's old address who knew him. whom he did not know. They are now bringing the German Fixes up to date. What a small world the Internet brings! The latest is that I told this new cousin about another cousin in Germany (Wolfgang Fix) which he knew nothing about. So there are now two German Fix cousins that are now getting to know each other. 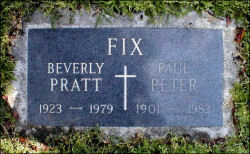 Hi, I've been reading the bio page for Paul Fix. My husband's mother always said they were cousins and her mother would go to California on a train with her sisters to visit him. I am very interested in genealogy and would like to contact his family you mentioned on your webpage. Her mothers name was Theresa Rose Fix who married William Amann. I'd be ever so appreciative if you would kindly connect us so I can add to this family. I don't know who Theresa Rose's father was. My mother in law and all the one's with the information are now gone. So there is no hope there to find more out closer to home. I've been doing genealogy for over 20 years. But most of my success stories have come from my own family as they had been in the US forever. We don't speak German so there is no hope for us written in German, nor have either of us ever been to Germany. Any help you can offer most certainly would be appreciated. Linda Huff Muessig — Carolyn did get in touch with me & Linda's family is part of their family tree. Thank you Carolyn, for doing this biography for me. I also would like to thank you for the pictures and all the information you have sent me. I know he was your Uncle Paul, but he'll always be Micah to me and a lot of other people. He is truly missed! Paul always said his birthday was the 9th, other sources says the 13th???? "Marshal Micah Torrance, may you rest in peace"